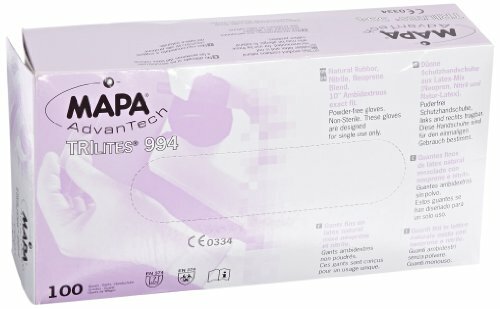 Mapa natural latex, neoprene and nitrile disposable glove. Tri-polymer formula for protection against chemical splashes. Applications: Laboratory: manufacturing of medicines, pharmaceutical preparation, research, analysis, handling of precision parts, research, analysis, manipulation of precision parts, optical processes. The manufacturer is responsible for the conformity of its products, with respect to the essential requirements of the directive. General Chemical Protection EN 374. Micro-Organisms EN 374. Wrist: rolled cuff. Interior finish: chlorinated. Exterior finish: smooth with pebbled palm. Size: X-large. Purple color. Measures 10-inches length by 0.006-inches thickness. View More In Sterile Gloves. If you have any questions about this product by MAPA Professional, contact us by completing and submitting the form below. If you are looking for a specif part number, please include it with your message.